I'm not great with graphic editing. It took an embarrassing amount of time just to figure out and create an alpha layer for my avatar some time ago, then some more time figuring out how I can get it to full dimensions while staying under the size limit of this forum somewhat recently. 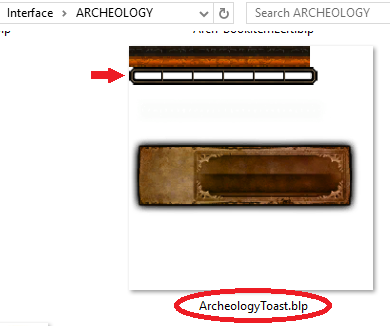 Anyways, I ask anyone familiar with editing BLP files to help me out with the Archaeology digsite progress bar. The overlay graphic has six segments but digsite progress is out of nine. I submitted an ingame suggestion to have it changed to nine segments, but I highly doubt Blizzard would do it, let alone even read my suggestion. Click for full size. Screenshot is from my extracted BlizzardInterfaceArt folder using a BLP thumbnail thing I installed a long time ago. I would prefer a separate file of just the overlay so I can put it with my personal addon and overwrite just that element. I'm perfectly comfortable with the code involved to use it, I just need the BLP file to do so. If it's easier to just edit the shared image directly, I'm fine with that as well. Easier on my end anyways to just drop it in Interface/ARCHEOLOGY [sic] with no code. I have attached the BLP file just in case someone that can help doesn't have an extracted art folder. Don't like combat text on frames? How does this look to you? Couldn't have it perfectly the same size for every segment since 190 (the bar's length including two pixels of black on each side) isn't divisible by 9, that might be as good as it gets unless you can make the bar one pixel less wide and still have it work properly. I highly recommend using .tga over .blp in addons, easier to use and I've had far less problems with it. Edit: also just noticed I made a small mistake in it; fixed. Last edited by Ammako : 02-18-18 at 07:17 PM. Sorry for the late reply. That looks great, I’ll be able to test it later on today. The image is not showing. I'm getting a green texture. After verifying code and path (setting different textures and copying the file into several folders to try) and some research, I found this silly limit that all texture file sizes have to be a power of 2. Turns out my first preference of just the bar isn't going to work unless the image is extended to 256x256 with a bunch of space and I use SetTexCoord(). So, I ended up figuring it out after all with some trial and error. I found this program called BLP Laboratory, opened the ArcheologyToast.blp file, converted to png, opened Gimp, deleted the old overlay (this took a bit, had to import as layers and found the alpha lock button), imported the png you gave in your post and moved to the old spot (kept looking for a hand tool, it's a four-point "move" tool lol), saved to the toast png, converted back into blp, and went with the second part of dropping it into Interface\ARCHEOLOGY with no supporting code. I sincerely appreciate altering the bar for me. I originally started out, before this thread, by taking a screenshot of the bar ingame, adjusting the segments in paint, then trying to add alpha in Gimp. It just wasn't turning out as clean as you made it. I should've found that BLP program earlier. Last edited by Kanegasi : 01-23-18 at 08:48 PM. Reason: Figured it out! Thank you, Ammako!